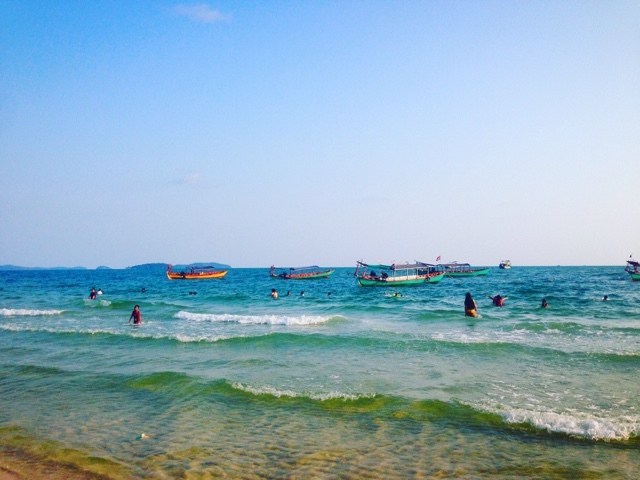 Slightly delayed by perpetually rubbish wifi (it’s a hard life) here’s that post I promised you about Sihanoukville, written from my hostel bed in Bangkok. Contrary to what the above photo would suggest, Sihanoukville is not the most picturesque place to stay. The town itself is expectedly shabby, and home to an assortment of bars where old western men shuffle around picking up hookers and ogling the girls who are passing through. The booze is incredibly cheap, with beer starting at 25 cents and a bucket of vodka and mixer starting at a liver-punishing $1. There are streets lined with restaurants selling ‘happy’ and ‘cosmic’ pizzas and milkshakes, twice the price of their less psychedelic counterparts but still coming in dangerously cheap at $8 for a pizza and $4 for a shake. What specific drugs make them ‘happy’ is dubious, and as selling/consuming drugs is actually illegal in Cambodia (…like anyone seems to pay any attention?!) it’s unlikely you’ll find much out by asking. Save your money and dignity, and stay safe, by just eating regular food. Suffice to say, Sihanoukville is a bit of a party town. There are plenty of great, cheap places to eat here, and as with Siem Reap there are enough internationals here that everyone is catered to. 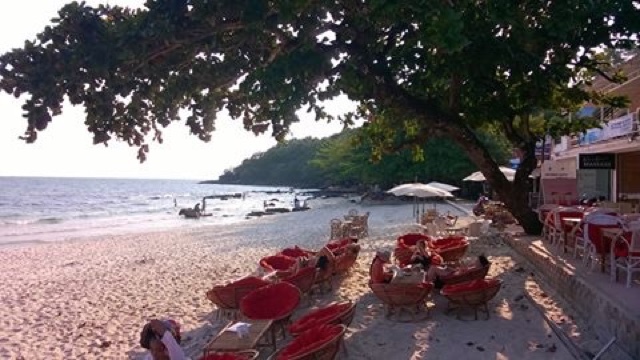 For a great Panang curry, head to Angkor Beach Bar on Serenity beach, where Thai and Khmer meals start at $3 including rice. If you’re craving western food, Monkey Republic on Serendipity Road do fry-ups and toasties as well as burgers, pasta and all manner of other home comforts- with meals starting at $3 and seemingly endless drinks deals. Their veggie burgers are so glorious I’m still dreaming about them now. Nightlife-wise, I’d be lying if I said I thought the bars here were anything special. But I’m not really a matching-vest-bar-crawl, competitive drinking sort of girl. If you just want to chill out and enjoy your stupidly cheap, questionable alcohol away from all the madness, you’ll be pleased to hear that the beach bars keep seating out on the sand late into the night, where you can relax away from the grime of the venues themselves. Smokey’s Bar at the Ochheuteal Guesthouse is also a good spot if you’re missing pub vibes in your downtime- there’s a pool table and comfy seating, as well as a decent selection of western booze. To get out of town in the daytime, book yourself onto a boat trip around the beautiful nearby islands of Koh Chalum, Koh Russey and Koh Tres. All around Serendipity beach are places advertising tours, and you shouldn’t need to spend more than $15 on a day-trip that includes snorkelling and a beach BBQ- though if you want to drink your way around, an extra $5 a head will get you all-day booze as well. You might think that life jackets are beneath you, but if you’re going to be swimming around for an hour without the ability to put your feet down (black sea urchins are not your friends, and the coral doesn’t appreciate being trodden on) trust me when I say that taking the free life jackets is a great idea. Lay on them and use them as floats or sit in them and use them as chairs, either way it prevents you from having to do actual exercise! Well there’s cleary no point wearing them properly, is there. 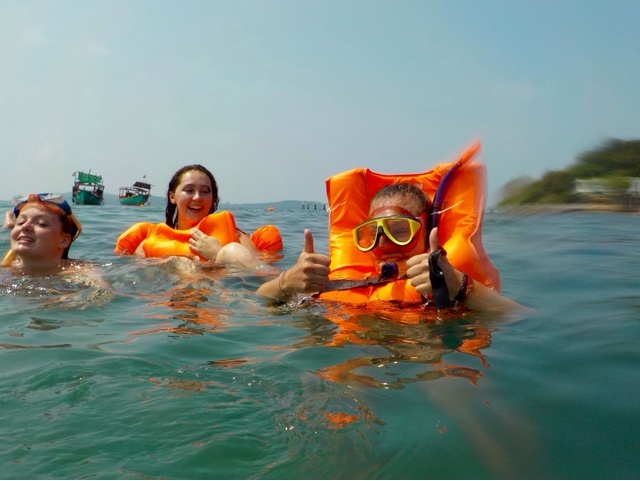 If you’ve got time, take a boat over to Koh Rong, where you can stay and chill on the island overnight or for a few days rather than floating back to Sihanoukville itself right away. A return boat ticket is around $20, and you can book a beach bungalow that sleeps 3-5 people for between $30-$40. 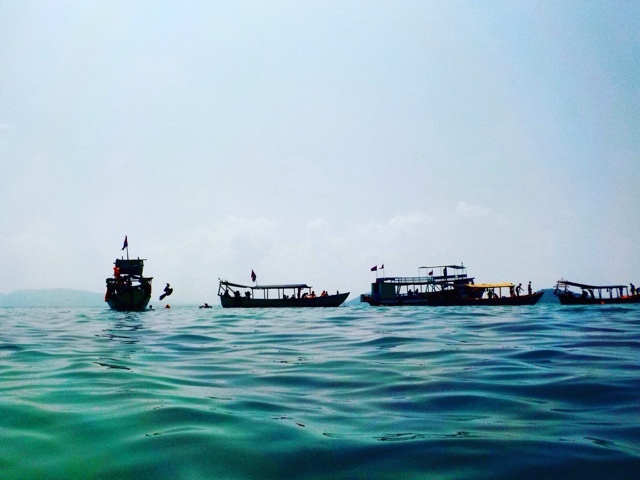 Whilst staying in the town itself is cheaper (with shared rooms starting at $2-$5 pppn depending on whether you want A/C or not) the beaches of Koh Rong are emptier and cleaner than those on the mainland, and universally considered to be worth the extra cash. If you don’t fancy some proper island life, it’s still worth getting a tuktuk to Otres Beach (about $10-15 from Serenity) which is bigger, cleaner and quieter than the main strip. Boats for jumping off of. As a final note, seeing as I’ve mentioned it, while you are here I would recommend being wary of spending your money on questionable foreign narcotics that might render you a total vegetable for the day. Having seen the state of some of my travel companions a full 12 hours after sharing a ‘happy’ pizza, I would at least suggest that if you’re going to burn time and money on being really confused and sweaty for a day of your trip, you don’t devour an entire product by yourself. Some of the goods just contain weed, some contain vast amounts of magic mushrooms – which you’re going to end up with is something of a lottery. If you’re on the prowl for a cosmic adventure, it’s the row of open-fronted restaurants on Occheuteal Street – just back from the beach of the same name – that seem to be the most blatant about their services.